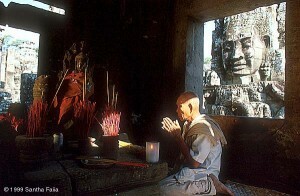 A Buddhist monk, overlooked by one of the 216 stone faces of Lokesvara, offers prayers in an inner shrine of the Bayon. Fishermen at work in the moat of the Bayon, the temple that marks the site of the North Ecliptic Pole in the Draco/Angkor sky-ground scheme. 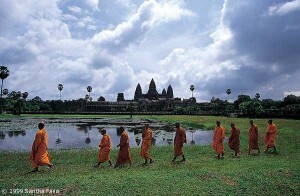 Angkor Wat: reflections in the sacred lake. A Buddhist monk burns incense in the central sanctuary of Angkor Wat - still a place of living religion to this day. 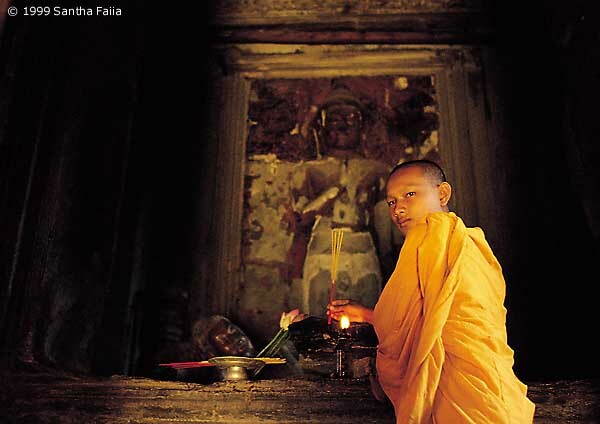 Statues were believed to be capable of containing the living essence of deceased individuals. 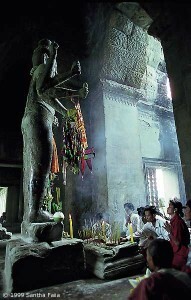 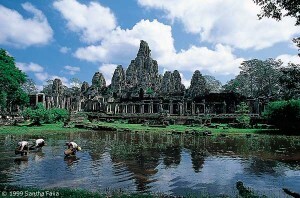 The cult of statues, called 'living images', is still active in Angkor to this day.